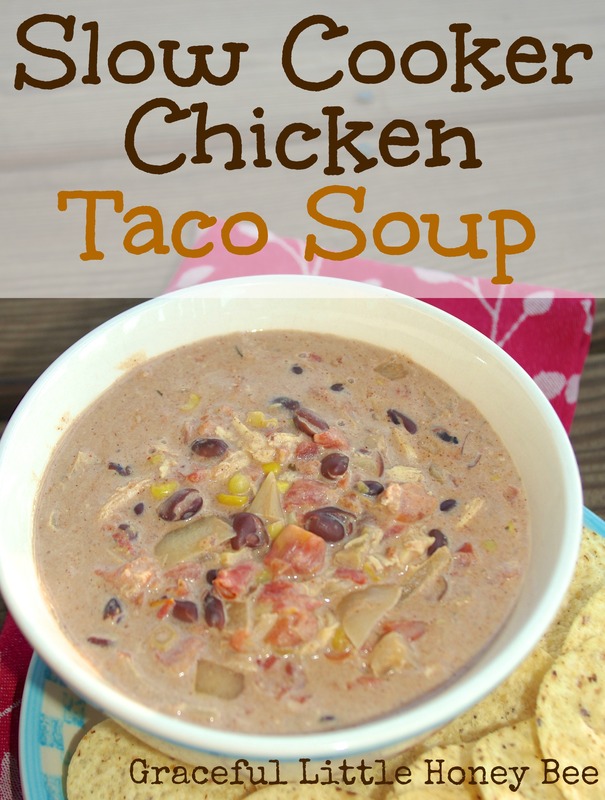 We eat this Creamy Chicken Taco Soup at least once per week during the Fall and Winter months. I love it because it’s easy to put together and is freezer friendly. In fact, it is one of the recipes in my most popular post 12 Easy Freezer Meals in 2 Hours for $50. I love making soups during the winter because they are frugal and flexible. You could easily swap the chicken for ground beef or omit the cream cheese for a healthier option. This recipe should feed 3-4 adults, but you can feed more by adding another can of beans and corn. I hope you enjoy! Step 1: Add all ingredients except cream cheese to slow cooker. Step 2: Pull cream cheese apart in chunks and layer on top of soup. Step 3: Stir cream cheese into soup once it is melted. Step 4: Cook on low 8-10 hours. Step 5: Shred chicken and serve with tortilla chips. Add all ingredients except cream cheese to slow cooker. Pull cream cheese apart in chunks and layer on top of soup. Stir cream cheese into soup once it is melted. Shred chicken and serve with tortilla chips. This one is delish Megen! I tried it last week and it quickly became a new favorite. I will say that mine ended up being not at all soupy - it was more like a tasty dip. Just used tortilla chips to dip it out of a bowl. Either way, it was awesome! I don't add water, but you could if you feel like it needs it after you put it all together. I just made this on the stove top with hamburger meat instead of chicken, and it was great! I'll definitely be making it as you've written sometime soon now that it's gotten cool. I ate it straight as I accidentally picked up lime tortilla chips instead of regular. Yuck! But the soup was great without the chips. Enjoyed reading some of your recipes. I'm a collector and I like to try different recipes. We make a tortilla soup with less ingredients and it's awesome. 1 can rotel 1 can corn 1 can black beans 1 can diced chicken (or cook your own ahead of time but make sure it is well-seasoned) 2 cans chicken broth Drain corn and beans. Add all ingredients to a pot on stove, bring to a boil, then simmer for 20 minutes. Serve in bowls topped with cheese and tortilla chips. Thanks for sharing. I love simple recipes! I normally don't drain, but you definitely can if you want. Also, I would say it serves 4-6.